This is the beautiful Pool Home you have been waiting for. Centrally located in the beautiful, gated 55+ Community of Heritage Cove...close to beaches, shopping, restaurants, and RSW Airport. 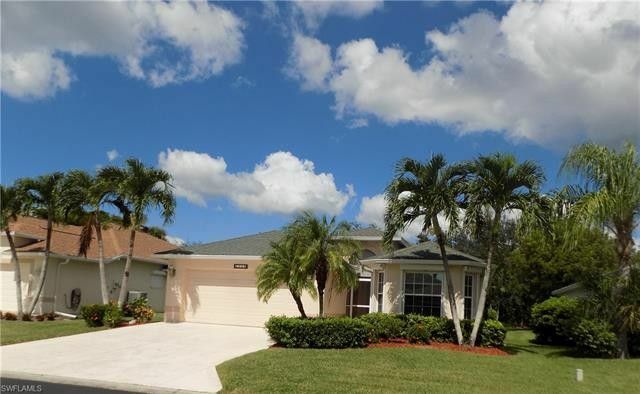 This lovely 2/2 + den home features large in ground pool, all tile floors, oversized garage (24'-8 X 20'-8 ), extra wide driveway, hurricane shutters throughout, freshly painted interior is offered partially furnished. Entry has lovely leaded glass entry door, great built-ins in the den, in home laundry, bay window in breakfast room for great views, hurricane blinds and so much more all in a great, friendly neighborhood. Heritage Cove is an active community with tennis on great clay courts, bocce, shuffleboard leagues, bingo, water aerobics, pitch in dinners, on site shows, exercise room, onsite property manager, low HOA fees with Internet and TV included, and so much more. Clubhouse also has a library, billiards room, media room, huge community room for parties and events, and restrooms that include showers...right off the large community pool. Hurry to see this one, it's the only pool home available in Heritage Cove, and move in ready! Call or text for your private showing today!